The industry's fastest read and write access for NTFS volumes in Mac OS X and now with new volume management functions for NTFS volumes! The new update makes Paragon Software the first developer to overcome the functional limitations of the latest version of OS X Disk Utility in El Capitan. Earlier versions of OS X allowed to easily format volumes in Disk Utility by implementing third-party file system drivers, but these functions are no longer available in OS X 10.11 El Capitan. 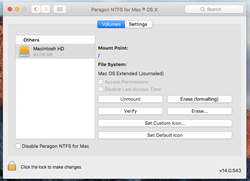 Addressing customer needs, Paragon NTFS for Mac 14 makes intuitive data media formatting possible once again. Furthermore, the product now allows users to check the file system integrity of NTFS volumes and repair them, if necessary. Instead of configuring command-line tools, the volume management functions can now be easily accessed directly through the program’s graphical user interface. New! Volume management functions for NTFS volumes. Ultra-quick read and write access to NTFS files in OS X. Supports all versions of NTFS. No limit to file or partition sizes (within NTFS and OS X constraints). Supports special NTFS functions in OS X El Capitan such as resource forks, hardlinks, symlinks and file permissions (POSIX file attribute). The transfer rate during file operations on NTFS partitions is just as good as it is for operations on native HFS partitions. Unparalleled stability – even during peak system utilization! Simply install it and go to work. No further system adjustments are necessary once it has been installed. OS X El Capitan 10.11 and back to 10.8.